“Let’s be good neighbors.” That is a request from the Grand River Dam Authority Ecosystems Management Department as it gears up for the 2016 Tulsa Boat Show as well as the upcoming summer season on GRDA’s Grand and Hudson lakes. During the boat show, and all year round, GRDA wants to help educate lake-are residents about issues such as flowage easements, GRDA project boundaries, the GRDA taking line around the lake and docks. This also ties back into an article previously published on this website about the #1 mistake people make when buying property at Grand Lake. You can see that HERE. 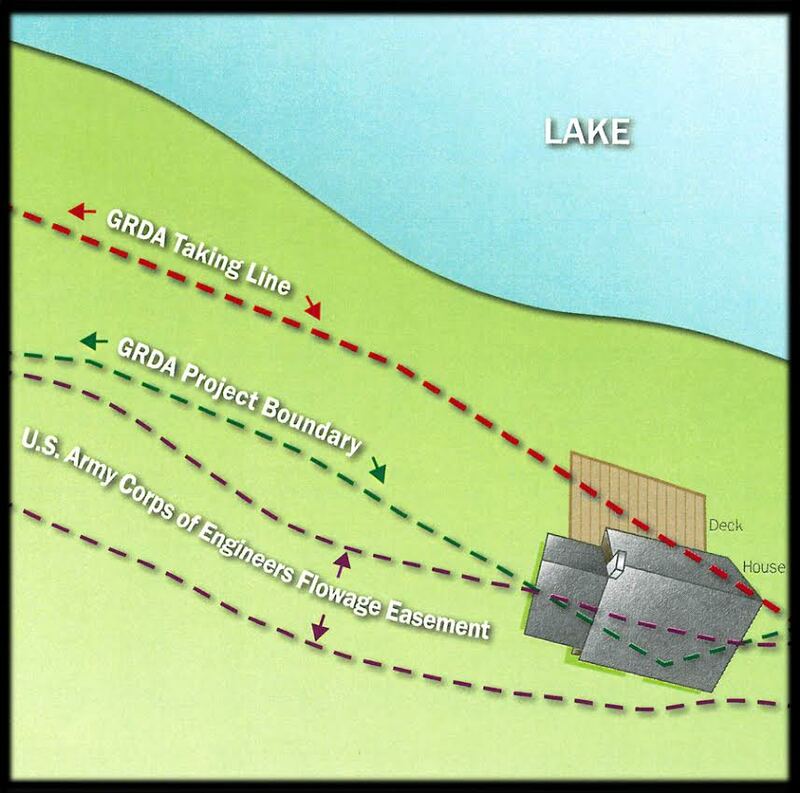 The boundary between GRDA owned property and private owned property around the lake is determined by a metes and bounds survey description, not an elevation. The boundary is commonly called the GRDA Taking Line. What if I own a structure on GRDA property? If you have a structure built on GRDA property it may qualify for a License to Encroach. A license allows the structure to remain in place for up to 30 years. See www.grda.com for details and application. What is a Flowage Easement? Basically, a flowage easement allows the property covered by the easement to be flooded with water. If your property is subject to a flowage easement, the easement will be found within your abstract. The terms of the easement will dictate how the easement affects the property, but generally you are not allowed to place a structure within the flowage easement that would impeded the flow of water over the property. The property I bought already has a dock. What now? I want a dock but the water depth is too low. What can I do? GRDA may allow dredging of its shoreline in certain areas around the lake if no contaminants are present in the area to be dredged and the Shoreline Management Plan (SMP) classification allows for such activity. An Application for Dredging can found at www.grda.com. What is FERC and the Project Boundary? FERC stands for the Federal Energy Regulatory Commission. FERC issued GRDA a license to operate its hydropower facilities (Pensacola and Kerr dams and the Salina Pumped Storage Project). When the license was issued, it was determined that certain property was needed to operate the hydropower facility. This area is called the Project Boundary. FERC has jurisdiction over management of lands within the Project Boundary and also over project operations such as the lake reservoir levels. What is the Shoreline Management Plan (SMP)? This document governs how the shoreline around Grand Lake and Lake Hudson will be managed. It can be found online at www.grda.com. Finally, the Grand River Dam Authority reminds you that before you cut, dig or build along the shoreline of Grand or Hudson lakes, you should first contact the GRDA Ecosystems Management Department at (918) 782 4726. GRDA Pensacola Dam Tours/Facility Information: 918 256 0899. Considering Buying Real Estate at Grand Lake?